WASHINGTON — President Donald Trump’s budget would drive millions of people off of food stamps, part of a new wave of spending cut proposals that already are getting panned by lawmakers in both parties on Capitol Hill. 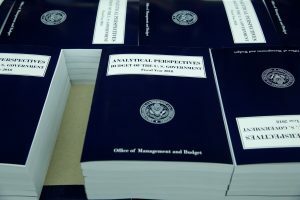 Trump’s blueprint for the 2018 budget year comes out Tuesday. It includes a wave of cuts to benefit programs such as Medicaid, federal employee pensions, welfare benefits and farm subsidies. All told, according to people familiar with the plan, Trump’s budget includes $1.7 trillion over 10 years in cuts from such so-called mandatory programs. That includes cuts to pensions for federal workers and higher contributions toward those pension benefits, as well as cuts to refundable tax credits paid to the working poor. People familiar with the plan were not authorized to discuss it by name and requested anonymity. Cuts include a whopping $193 billion from food stamps over the coming decade — a cut of more than 25 percent — implemented by cutting back eligibility and imposing additional work requirements, according to talking points circulated by the White House. The program presently serves about 42 million people. The food stamp cuts are several times larger than those attempted by House Republicans a few years back and comprise the bulk of a 10-year, $274 billion proposal that’s labeled as welfare reform. The new cuts are unpopular as well. Instead, the Trump tax plan promises an overhaul that would cut tax rates but rely on erasing tax breaks and economic growth to end up as “revenue neutral.” It would create three tax brackets — 10 percent, 25 percent and 35 percent — instead of the current seven. Trump is also targeting the Medicaid health program that provides care to the poor and disabled, and nursing home care to millions of older people who could not otherwise afford it. The House had a bitter debate on health care before a razor-thin 217-213 passage in early May of a GOP health bill that included more than $800 billion in Medicaid cuts over the coming decade. Key Republicans are not interested in another round of cuts to the program. Details on Trump’s budget will not be publicly released until Tuesday, but Mulvaney has briefed Republicans about what’s coming and his staff has provided targeted leaks to the media. A full budget submission by the administration to Congress is months overdue and follows the release two months ago of an outline for the discretionary portion of the budget, covering defense, education, foreign aid, housing and environmental programs, among others. Their budgets pass each year through annual appropriations bills. An earlier blueprint from Trump proposed a $54 billion, 10 percent increase for the military above an existing cap on Pentagon spending, financed by an equal cut to nondefense programs. Those cuts rang alarm bells for many Republicans, who were particularly upset about proposals to eliminate community development block grants, slash medical research and eviscerate foreign aid. Trump’s GOP allies rejected such cuts when wrapping up long-overdue legislation for the current budget year, which ends Sept. 30. There’s little sign they will have a change of heart now, especially with Trump’s administration in turmoil and his poll ratings at historic lows. “The budget’s a starting point. We’ll go to work from there,” said Sen. John Hoeven, R-N.D., a member of the Senate Appropriations Committee. Republicans controlling Congress have delayed action on their companion budget measure, waiting for Trump to go first. This year’s budget debate, Republicans hope, would grease the way for a major overhaul of the loophole-cluttered tax system. But House conservatives also want to embark on a round of cuts to benefit programs and are open to Trump’s suggestions for cuts to mandatory programs such as federal employee pensions. Presidential budgets are mere suggestions, and the White House has discretion to assume higher economic growth rates of up to 3 percent or so under Trump’s agenda of tax changes, loosened regulations and infrastructure spending. Tuesday’s budget will also include proposals such as paid leave for parents after the birth or adoption of a child, a $200 billion infrastructure plan that Trump officials claim could leverage, along with private investment, up to $1 trillion in construction projects, and funding for Trump’s oft-promised wall along the U.S.-Mexico border. The budget contains $1.6 billion for wall construction, along with $300 million for additional border patrol and immigration agents as part of a $2.6 billion hike for border security programs.